I had never been past Khaplu in the Ganche District of Baltistan, a lovely green valley encircled by towering mountains. 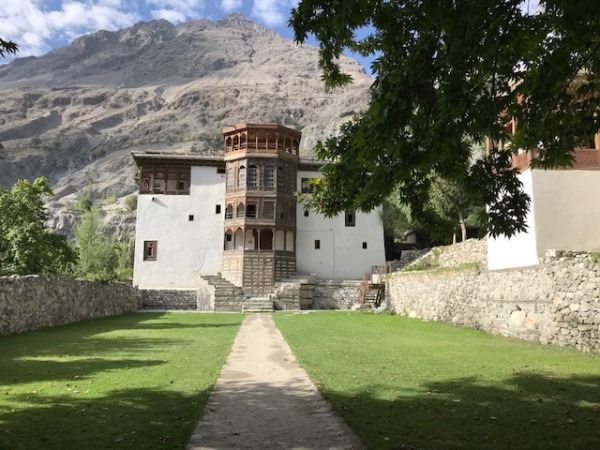 I had stayed a few times at the picturesque Khaplu Fort Palace Hotel, which has painstakingly been restored by the Aga Khan Trust for Culture. 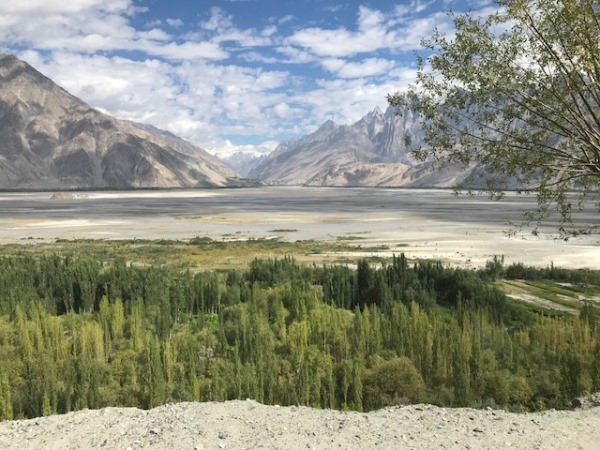 Hence, I was excited to actually drive past Khaplu and head further north towards our border area with India’s Ladakh region. This is a restricted area controlled by the Army and most tourists are turned back. Luckily, we had clearances as we were heading to a village called Siksa, around an hour and a half drive from Khaplu, where Aisha Khan, the intrepid CEO of the Mountain and Glacier Protection Organisation (MGPO) was implementing a water replenishment project with the support of United Nations Development Programme-Pakistan (UNDP) and the Coca Cola Foundation. During our journey, we stopped at perhaps what is one of the most stunning views in Pakistan – the lookout point for Masherbrum or K1 Mountain. Almost 8,000 metres high, its summit was lost in the clouds but the vast, flat valley before us and the snowy peaks beyond were an incredible sight. After taking in the breathtaking view, we reluctantly got back in our jeeps and headed to the fertile Siksa Valley, whose residents proudly claim that after Hunza Valley, they are the most progressive and well-educated of the high mountain communities of the Gilgit-Baltistan region. Certainly, Siksa is a lovely valley, with its terraced fields and neat houses adorned with flowerpots. View point of Masherbrum peak in Ganche district, Karakoram. 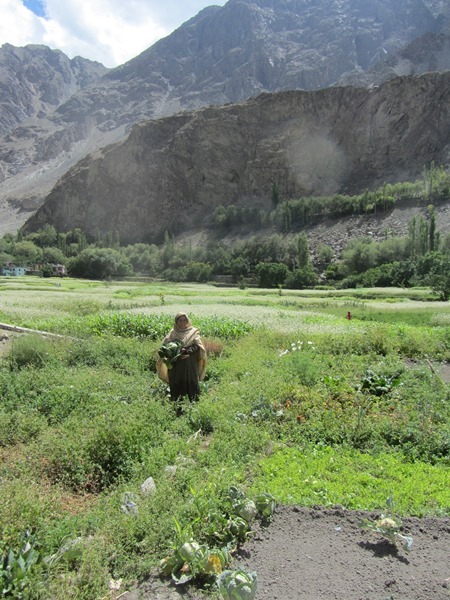 Khanum in her green fields in Siksa village. 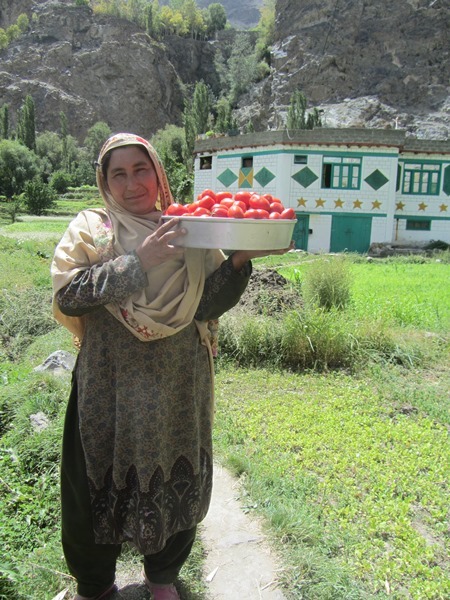 Khanum showing off new tomatoes grown in Siksa this summer. Interestingly, the community contributed around one-fifth to the project cost and the labour. The water storage tank was built a year ago, and is supplied by a pipeline that transports water from a natural spring high up in the mountains above Siksa, situated at an elevation of around 11,000 feet. The pipeline is buried in the soil so it does not freeze in the winter. It is a simple technology based on the steep gradient of the mountain slopes, but it has proved to be a near miracle for the 500 households of Siksa village. The storage tank high above the village supplies water to various irrigation channels flowing down to the settlements below. I climbed up to take a look at one of them and indeed the water was gushing down the slopes. Today, around 4,000 community members are benefiting from this scheme. The storage tank has a capacity of 8,000 gallons (from both spring water and snow melt). It was inaugurated in the spring of 2017 and that summer, they had their first big crop of vegetables. This year, another bumper crop has arrived of tomatoes, onions and potatoes, which they can sell to the nearby markets. Pumpkins in the small terraced fields. “I would say that with this new irrigation, previously barren lands are now producing crops. There has also been tree plantation. The local community has planted a total of 10,000 Poplar trees and are now adding fruit trees. They have access to around 800 canals in the valley and every year they say they will plant more trees to increase forest cover and counter climate change. Fruit trees mean more nutrition and money for them,” Khan explained. 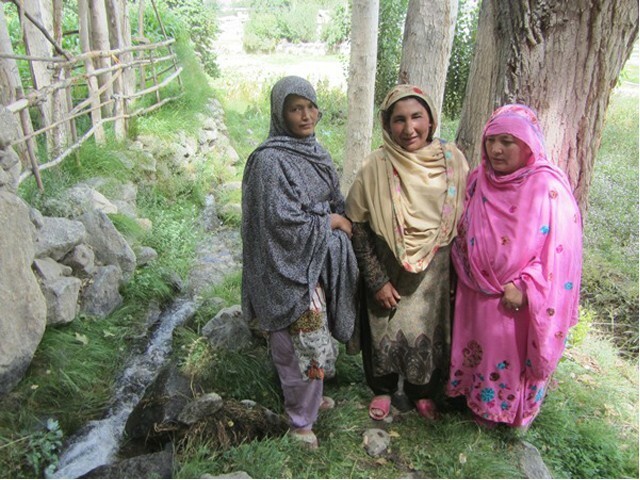 “You know, earlier we used to have so many fights over the limited water supply in the village as we had to wait for the snow to melt for the water to flow down into the channels, and there were always shortages,” said Shereen Akthar, the local representative to the Gilgit-Baltistan Legislative Assembly. Usman Manzoor, the Programme Officer from UNDP who accompanied us, told me they were keen to promote partnerships with the private sector so that more of these projects could be implemented. 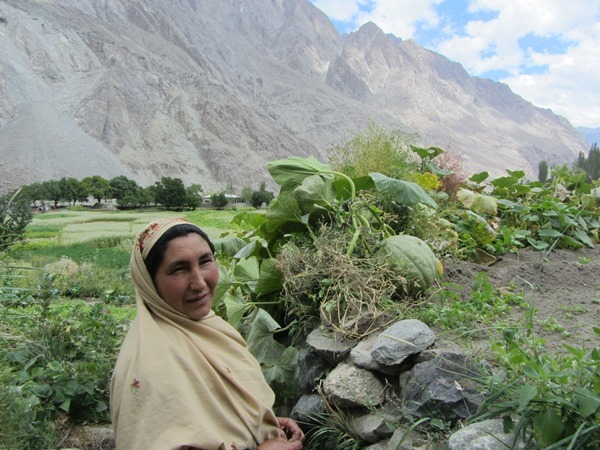 Moreover, Siksa’s success has led to another project, which was recently completed by the MGPO and UNDP in the village of Gole Tassu near Skardu. This project also included the construction of a water storage tank that is now operational. Every month, the tank collects runoff from a perennial spring located deep inside the bare mountains overlooking the village at 12,000 feet. We visited the site of this project and met the local community who were thrilled at our arrival and showered Khan with rose petals and garlands. A pipeline (dug three feet deep to give it insulation) feeds the water from the spring to a storage tank with a capacity of 5,000 gallons built at some distance. More pipes then flow from the tank down to the village below. “We don’t anticipate that the spring will dry out. It is a clean source of water, we have had it tested. Earlier the villagers would fetch their water from a pond fed by snowmelt, which was contaminated with faecal matter and bacteria and it made people sick,” said Khan. There is not enough water from this spring for the irrigation channels to provide for 360 households in Gole; it is only enough for clean drinking water. There are eight water points in the settlement with taps where people can collect water. The NGO is thinking of building separate pads for washing and cleaning. “Earlier, the water was unuseable but we had no other choice. We would get sick or else have to climb up to fetch water from the mountain ridges. Now gradually, people’s health is improving,” said Laila Batool a community member. Gole Tassu certainly needed the clean water. A dusty village, it is a far cry from Siksa with its green fields, clean homes and children in neat clothes. It will take some time to see the transformation in Gole Tassu; they have already requested the NGO to give them bathrooms and solar geysers. 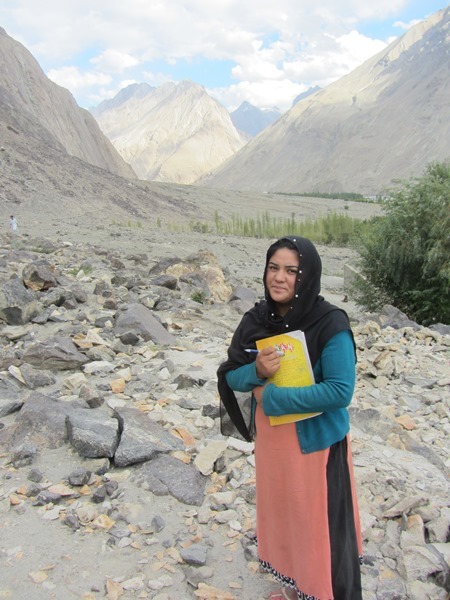 On our way back to Skardu, we stopped at yet another village called Tholdi, a settlement of around 300 households. There are plans to start another water replenishment project in this valley. “The spring is up there behind that mountain and once the water is piped down, all this barren land will become green,” said Khan, pointing to the rocky outcrop on which we were standing above the village. Tholdi village hopes to become green as well with a water replenishment project. I hope that happens and I can go back and witness it myself someday. 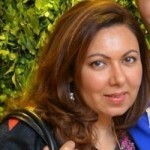 Ms. Rina Saeed Khan is a foremost, renowned, environmentalist in Pakistan. She knows her job very well. Knows what she is writing about. Well informed. The photographs are stupendous. Capturing the beauty of Pakistan’s Switzerland.